The local team brought me to an outlet of this sundae sausage chain while we were in transit between meetings. 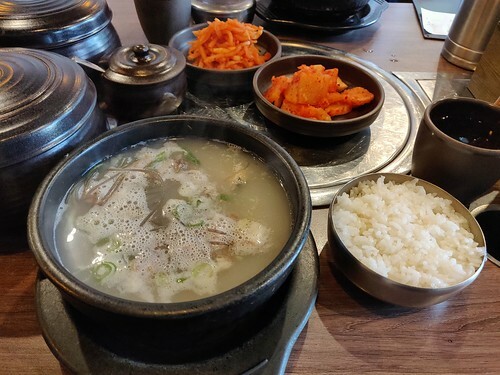 They offered this sundaeguk soup version, which was awesome, not just because of the intestine-stuffed cuts of wiener, but also the cloudy seolleongtang-like broth that they arrived in, bubbling away. There were black pepper shakers on the table to give it all an extra edge, and I liked it so much that they were able to bring me a refill of soup too. That was very satisfying!